At the time of this post, devastating fires just 75 miles from here make thinking about recipes seem so insignificant. Yet we still fuel body and soul as we continue on. 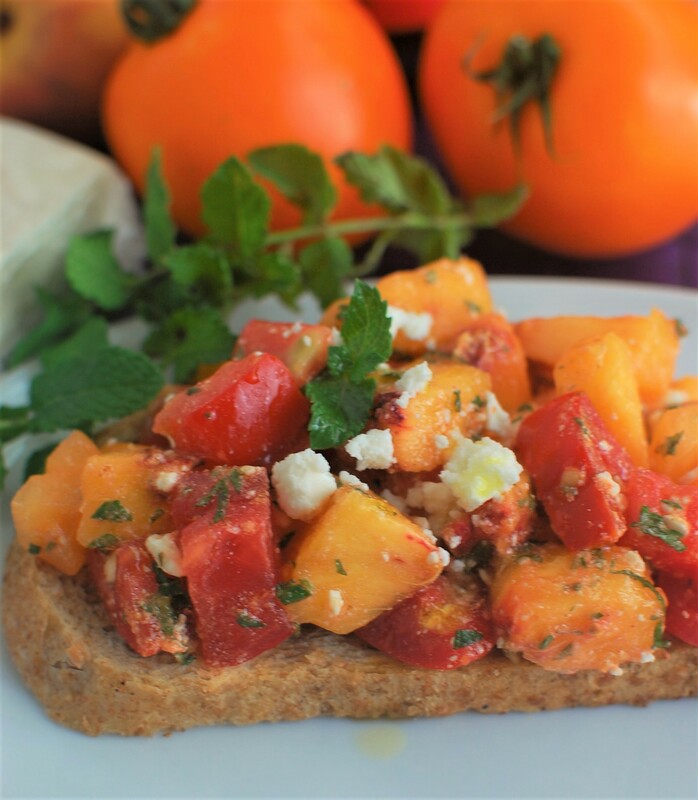 End-of-summer golden tomatoes and peaches make this classic tomato-topped toast called Bruschetta. (Pronounced “broos KET tah”). I like mint instead of basil in this twist on the traditional tomato and garlic bruschetta. I skip the garlic although a garlic clove could be rubbed on the toast with a drizzle of olive oil. And if you prefer to use basil, it’s the same family as mint and perfectly interchangeable in this recipe. 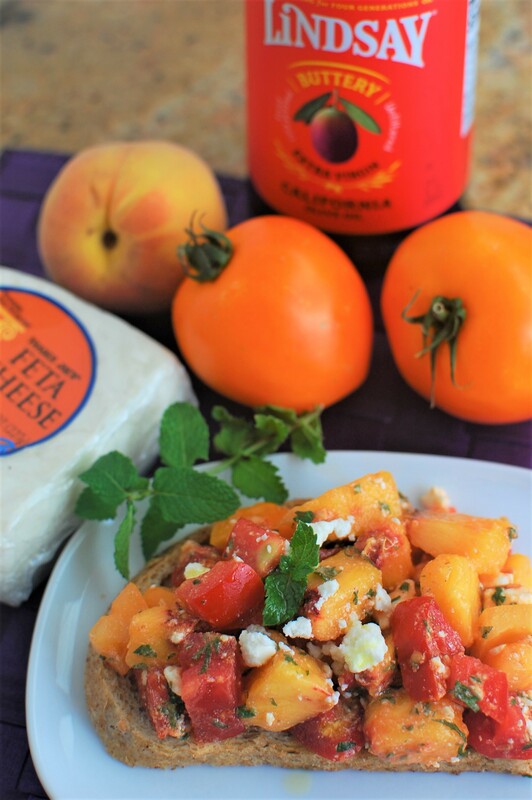 Olive oil adds the finishing caress to marry tomatoes and peaches with salty feta and fragrant mint. If you’ve not combined tomatoes with peaches, try it, they’re botanical siblings anyway and the balance of acid and sugars work beautifully together. I’m still getting red and yellow heirloom tomatoes in my weekly organic box from Riverdog Farm, and am the lucky recipient of my neighbor’s late-summer crop. If you can still get peaches in your area I hope they’re sweet like mine from the Central Valley. Or remember to try this recipe next season. Once you taste you won’t forget the flavors, I’m sure! When I attended the International Food Bloggers Conference (IFBC) I learned about Lindsay Olive Oil, a buttery California olive oil from the folks we know of as a ripe olive company. They call it Buttery Extra Virgin, and it really is buttery. Drizzled on toast with a little salt instead of butter, it’s my new toast topper, and sometimes with orange marmalade too! **I received conference discount from IFBC in exchange for a blog post of my choice. Prepare these Bruschetta ingredients in proportions to your own taste, or what you have on hand. Serve immediately. Place in a bowl with finely chopped fresh mint or basil. Stir in crumbled feta cheese. Season lightly with coarse salt if desired. Spoon over toasted baguette or crusty bread. Salad Dressings -- homemade or store-bought? Yes, the fires are devastating. Makes me appreciate even more how fortunate I am. Your “recipe” is totally my style, Rosie! Simple and flexible. Thanks for spelling out the pronunciation of bruschetta. I often tell folks “ch” in Italian is like K in English. Good example is chianti wine . Ditto Rita. We ALL need simple now for sure. Glad you like the pronunciation! Funny you should post about this–I did a watermelon, tomato, and feta salad for a project recently and I didn’t know if I’d like the combo of tomatoes with fruit, but it was really good! Your similar combo is, I’m sure, great as well. oh yes, watermelon, tomatoes and feta is a star combo too! Such a rough week you’ve had in Napa, and it continues. No one ever could have imagined this many days and the destruction.